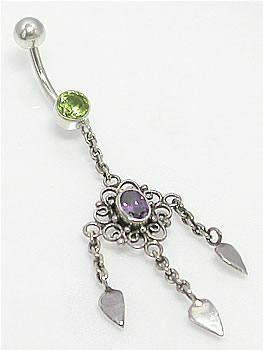 This Chandelier Purple Belly Button Ring features a light green round bottom jewel with an elegant dangle chandelier. The chandelier has a purple oval center jewel with an intricate spiral design and three diamond shaped sterling silver charms. Check out for these matching Purple Chandelier Earrings.